No matter what those princesses high up in their towers might think, everyone knows that wicked queens have more fun! While all of us were told who to cheer for when we were kids, nowadays we're all grown up and we just might see a different side of things. Just think about fairy tale villains, this wicked queen was not only the fairest in the land but she had her own lab to cook up potions. She had a magic mirror that was the closest thing anyone had to a television. Basically, she was made in the shade. The evil queens in fairy tales know how to shrug off the rules of the patriarchy they were living in. Sure, there might have been a king sitting on the throne when this queen rolled into the kingdom but it didn't take long before everyone knew who was truly ruling the realm. Who knew that evil habits would be so effective! This ankle length dress is form fitting to the hip and flows around your legs, making striding into the castle hall to make a dramatic entrance easier than ever. Of course, the red-lined cape will also help make your striding step memorable. Not much is better than a cape flowing behind you when you're on a vendetta to prove that you're still the fairest in the land. Top your look off with the classic black-capped crown, this costume will conjure memories of childhood and let you wholly embrace your wicked side! Not all of us were born to stroll through the woods, singing in harmony with the birds and making plans with forest creatures. In fact, many would call that unhinged behavior. Yep, some of us were built to take the thrones as queens rather than hide away as princesses. Life is too short to be locked in a tower waiting for some kind of prince. 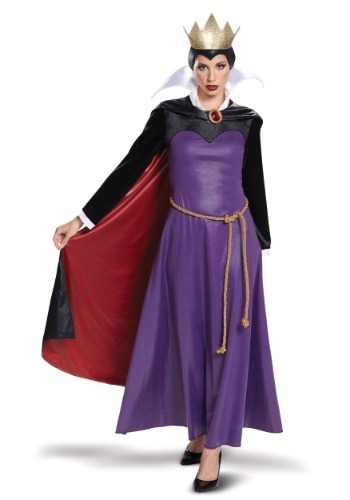 So, take on the best fairy tale role at your next costumed event. Become the Queen!